Transportation has always played a dominant role in shaping our urban environment. Historically, cities were built around the basis of everyday activities on foot; consequently, the prominent urban form was dense, compact, with high concentration of mixed-use development. As transportation technology progressed, the design of cities dramatically changed, in many ways to the detriment of the pedestrian. In Los Angeles, nothing has had a greater impact on the landscape than the car. Widened lanes, expansive freeways, large multi-lane systems, sprawling parking lots, and other amenities built around the needs of the car have resulted in a public realm that is often unsafe, unappealing, and stressful for the public. These issues have created challenges for L.A. planning professionals who want to enhance and balance our transportation infrastructure. How can we retrofit the existing urban fabric to meet the needs of multi-modal transportation? We have already experienced a response to this with a rise in the number of projects aimed at implementing more progressive transportation planning practices within the last decade. 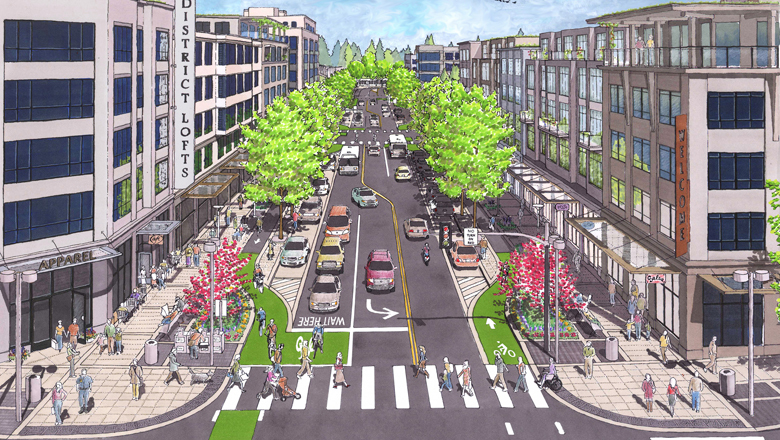 Bike lanes are being installed, sidewalks widened, and public transit lines expanded. The May approval of the Mobility Plan 2035 by the L.A. City Council is a clear sign that a majority of our city’s leadership shares in a vision for creating a more livable city. Before this, the city lacked a cohesive vision or framework to institute these changes. How effective this plan will be remains to be seen, but in the least it is a step forward. Of all the different forms of transportation to be focused on, walking is one of the most neglected in terms of infrastructure and policy development, but holds the most potential to enhance livability. Increasing walkability should be a main focus of urban design and policy because it is the solution to many problems that plague our city including pollution, congestion, and obesity. It serves as a catalyst for increased physical activity, commerce, social interaction, and environmental sustainability. This past year, as a senior at Occidental College, I completed a yearlong research project aimed at identifying the best strategies for enhancing walkability in downtown Los Angeles. Within this project I compiled a twelve-step guide with the help of city planners, residents, business owners, architects, walking advocates, and more. Most guides to improve walkability include the big suggestions such as expanding mass transit, reducing parking, widening sidewalks, etc. Below I will list three of my steps that do not receive enough attention despite the fact that they have the power to dramatically improve walkability with minimal time and effort. 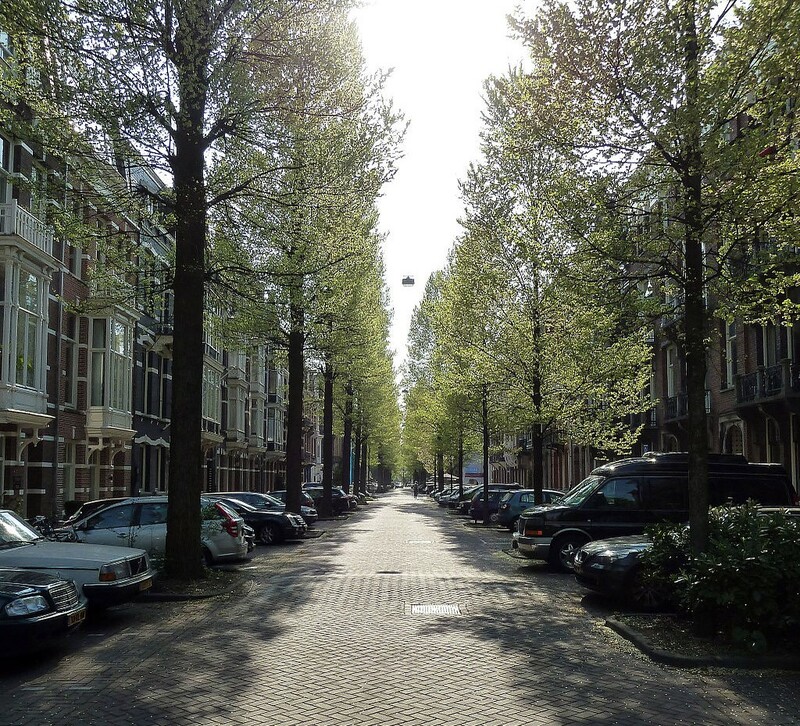 Planting trees is one of the most simple and cost effective ways of attracting pedestrians. Advantages include shade, reduction of ambient temperature in hot weather, absorption of pollution, reducing car speeds, and the creation of a barrier between people on the sidewalk and traffic. However, perhaps the most important benefit of planting trees is their contribution to aesthetics and creation of street character. When walking down most streets in downtown you will find trees, but they are often far and few between. In many cases they are Ficus trees, and while they hold aesthetic appeal, they possess top-heavy root systems that tear up sidewalks and destroy underground piping causing millions of dollars in damage each year. Selecting approved species of trees, especially those that are drought tolerant, and planting them in strategic intervals will result in interconnected canopies that truly enhance the walking experience. (Much like the picture above). When replacing already planted trees, such as the Ficus, the city often plants juvenile specimens that provide a fraction of the benefits of an adult. Having foresight in tree replacement projects is essential. If planting trees is part of the plan, I would suggest purchasing the trees as a first priority, so when it is time to plant the tree, often times many years later, the trees will have had time to mature and offer more immediate benefits to the street. Street vending is an effective way to lure people outside of their homes and into the public realm. 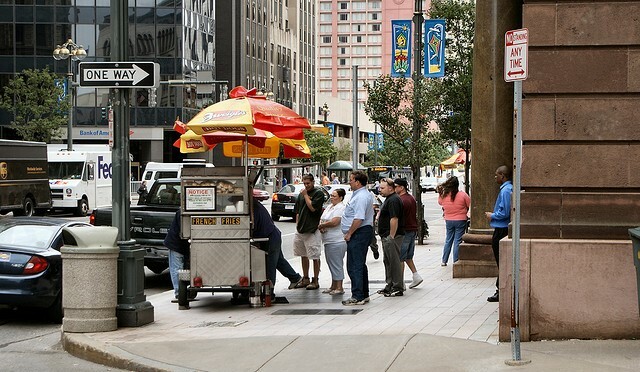 However, under current laws street vending is illegal in Los Angeles, albeit with a few small exceptions. While the debate to legalize street vending has received a fair share of attention in the past few years, the discussion usually revolves around its legality or health implications. What is often overlooked is how street carts can dramatically enhance the walkability of a street in a number of ways. A cart on a street corner adds a human dimension to a street that may otherwise be dominated by cars. Vending encourages people to walk outside and congregate, and crowds tend to attract even bigger crowds. Safety may even be increased as more people mean more “eyes on the street” discouraging crime and creating a sense of security. Areas that were once empty and unused can be transformed into hotspots of social interaction, embracing our city’s cultural diversity through the exchange of food. In addition to the benefits for walkability, street vending has the potential to create jobs and provide healthier foods in low-income areas. Legalizing street vending by creating a citywide permit system would turn this illegal activity, already taking place across the city, into a regulated and taxable industry that will draw more people into the streets to enjoy Los Angeles. It must be noted that the city’s department for inspecting street vending is severely understaffed, so expanding this division must be a priority if street food is to be made legal. 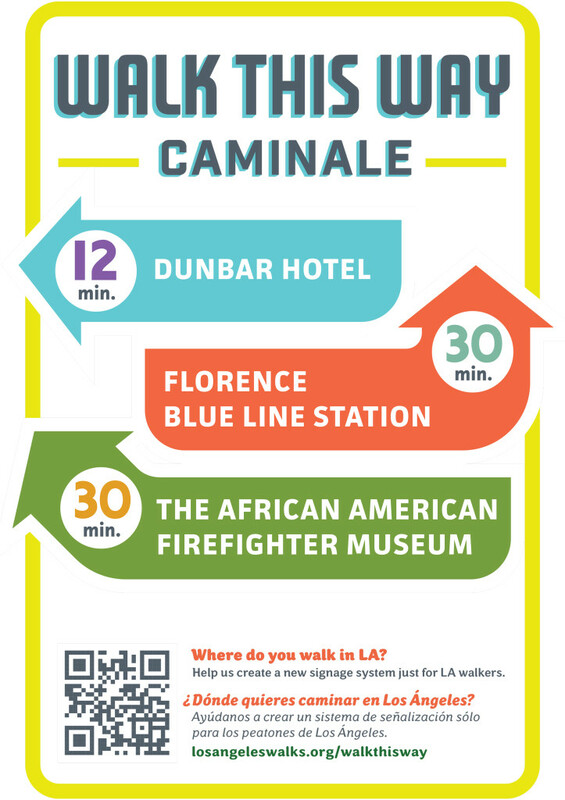 An interesting concept that is currently being developed by the walking advocacy group Los Angeles Walks, is pedestrian way finding for Los Angeles. The picture above is a draft design for one of these signs that will depict walking times, not distance, to popular destinations. (Note: studies have shown that listing times rather than distance encourages more people to make trips by foot). The goal of this project is to show neighborhood connectivity and change perceptions that many places are too far away to walk. The challenge here will be to create a uniform design that can be implemented and recognized across the city. An additional suggestion would be to create subway style maps that show walking times to a large number of places in a targeted area. These three simple and low cost recommendations, not only exclusive to downtown, have the ability to transform uninviting streets into areas that attract people and encourage them stay. Redesigning Los Angeles around people, not cars, is the key to creating a more livable city that all Angelenos will benefit from. Brilliant idea about the walking signs…when you get downtown one wants to get the most of their walking experience! I’d also like to see the city/county get rid of all pedestrian beg buttons at intersections located adjacent to Metro stations. Pedestrians should not have to “beg” to cross the street in areas that are supposed to prioritize pedestrian use. And for those beg buttons that remain, there are several reprogramming options that could be enacted to make them more friendly for use. I really like some of these ideas but providing suggestion that many of us in the field are very aware of isn’t new. I think we give far to little credit to the planner at the City as many of them know these concepts and treatments but there are far more issues at hand than what that article and maybe his paper delves into it. Take for instance street trees; its not just the root system one has to worry about but maintenance of the trees, business worried that signage and storefronts aren’t viable, sight lines for cars, ADA, access for large vehicles, Metro bus, stops blocking signage and more. The street trees are easier to implement in some locations throughout LA but if we are focusing on DTLA, having tree be both big enough and in tight enough spacing to create a canopy is very hard. I love street tree but context is important when we are talking about downtown areas. Even by expanding sidewalks we will still have a number of issues with them. Alex I think covered signage well in terms of distance and time but there has to be considerations again for what goes on the sign, who is paying and maintaining sign. I want to believe everything is doable and I love the ideas, sometimes I think people severely underestimate the knowledge that exists at the City, some of these people have masters degrees in urban and regional planning, and these things haven’t been done because there are real obstacles to implementation. I remember I spent a summer in West Berlin in the early eighties and after a week or so I got the impression that every single street in the city was tree lined. So I spent the rest of the summer looking but couldn’t find one. Now I know there are a few — for example, Wilmersdorferstraße goes several blocks without trees. But places like Sauvignyplatz make you think you’re in a park, not wedged between a major arterial and a train line. And the trees are really the trick. The trick with downtown trees is to plant them in the parking lane, not on the sidewalk. The biggest problem with downtown is that it doesn’t have enough people outside of business hours; the more people move in, the more walkable and lively downtown will be. Downtown has averaged 5% annual population growth in the past five years. Population is currently at about 50,000 now. 5% annual growth means a paltry *7* people moving to downtown every day. In downtown, there is high end housing, and there are ‘tent cities.’ The high end housing is competing with similarly priced housing in places like West Hollywood, Hollywood, Miracle Mile; Koreatown is even cheaper. Downtown comes up short in that battle for many people. Downtown would grow much faster if it could offer housing for less than its ritzier rivals; I think this is possible if it relaxed parking requirements, onerous permitting, property taxes (apartments are taxed at higher rates than single family homes, favoring sprawl over density) and other regulations that raise the price of housing but not its safety. Microhousing in particular seems like a promising path for boosting growth through naturally affordable housing. Agreed. One of the most infuriating things about trying to cross the street on foot is pushing the button and watching as the light goes through a complete cycle without giving a walk signal. The way it should be is this: Either you have a button, in which case pushing it pre-empts the signal timing to give you a walk, or you have no button, in which case you get a walk signal each direction in every cycle. And when someone crossing the street cater-corner to me presses the beg button, not only their crosswalk should get the walk signal when the light turns green; my parallel crosswalk should as well. Otherwise, if I don’t arrive in time to press “my” button, I get stuck at a pointless red hand while my fellow pedestrians using the parallel crosswalk enjoy a walk signal. Start working at getting rid of the center turn lane and use the space for bike lanes. By getting rid of the center turn lane you slow down traffic very easily, and many times that is what we’re trying to do, yes? The space dedicated to bikes after doing this, is far better used and nothing is taken away from cars. They can still do their left turns. Agreed on all points. I’d also point out that though it’s not necessarily a talked about urban planning tactic, one thing that would be HUGE for getting people walking in DTLA is more grocery stores and markets. Grocery shopping is one of those things that everyone does several times a week, and it’s one of the few destinations where it pretty much doesn’t matter which one you go to, so long as it suits your needs. Getting people walking to fetch groceries alone could have a huge impact downtown, but we’re kind of dropping the ball on it. Right now, all we have is the Ralph’s and the handful of niche stores in the Arts District and Little Tokyo. My go-to used to be Two Bits market, but now they’re closed, which means I either need to bike to Ralph’s for crap produce, or to urban Radish for decent, but way-too-expensive produce. I’m an avid biker, so I don’t mind the schlep, but I imagine there are tons of people who think that’s just too far. And what’s more, neither of those grocery stores are really what I’m looking for, so despite their bikability, a lot of the time I end up just driving to Trader Joe’s in Silverlake. I imagine the Whole Foods about to open might help remedy this situation a bit, but what we really need is a good dose of decent, independent markets sprinkled into the urban fabric. I’d bet money that it would have a significant impact on walkers in the area. It’s funny that America can pretend to be a beacon of free market ideals and has a blanket ban on buying and selling goods in public. To me, buying and selling goods in a public place is the definition of a free market. #2 A fully built-out network of protected bike lanes. Cars simply do not respect unprotected bike lanes. Neither do buses, city tow trucks, police cruisers, or motorcycles for that matter. #3 Bulb outs at every corner and mid-block crossing. #5 Executive order to LAPD to immediately halt jaywalking stings and to begin ticketing drivers for red-light running. I could add a few more about better street furniture, street trees, dog waste facilities and more thorough cleaning of the sidewalks on a daily basis, but the six items above would be enough to transform DTLA into a walkable paradise. If/when you need to make a Trader Joe’s run and want to avoid using a car (and dealing with the requisite parking drama), try the TJ’s located on Arroyo Pkwy in Pasadena. It’s only a block from Metro’s Fillmore Station. It’s a solution that’s worked well for me and my family for the last few months. Easy peasy lemon squeezy, as my daughter would say. No prob! Since we got rid of our car, I’ve been honing my skills at using Google Maps to find hidden gems located near the Metro stations! There was an interesting article on San Francisco’s guerilla tree movement (they spliced female trees on the male trees and those female branches sprout fruit). Anyways, the problem that perked my attention from that article is that I have horrible allergies and trees seems to be the culprit. I can’t remember the specifics of the science, but I remember that we should be selecting sterile females instead of male trees as the males produce much or all of the pollen and so if you select all males (the current practice) we are creating an environment where people like me can really suffer.